Configuration pencil icon missing from third party node. How to debug? I want to use a third party node which connects to a websocket of an ISY994i. This node requires configuration, however the pencil icon used to open the config panel is missing and I can't figure out why. I submitted this issue to the developer, but haven't gotten a response yet. I'm hoping someone here might be able to shed some light on this or at least confirm that my issue exists for them as well. Can you share your node’s HTML - in particular the object you pass to the RED.nodes.registerType function? what versions of NR and node.js ? any error messages on the NR log at startup? Yeah, that’s going to be a problem due to my hardware unfortunately. I’m stuck because everything requires a newer OS in order to compile and I can’t upgrade the OS without completely killing the performance of the mac mini because 10.6 is the last OS that supports the Core 2 Duo. I will do some testing on my laptop and see if I can tie this issue to the nodejs version. @fahrvergnuugen I’ve just installed the ISY node and I get the same error as you when I add the node to the workspace. So yes, something is broken with the node, but Node-RED ought to be handling it better whatever it is. @knolleary Well that’s a relief - I’m really hoping this error isn’t due to my outdated nodejs install since there isn’t anything I can do to fix that besides throw $ at it. odd because it works fine for me. @zenofmud sorry for the confusion - i am definitely running 0.18.7. I had accidentally pasted the startup log from a few weeks back. I edited my post above and put today’s startup log. @zenofmud That has to be the problem - it would also confirm that my issue is due to my outdated nodejs. The question now is - what version of NodeJS is @knolleary running? My guess is that this syntax was added to nodejs. I have tested with both node 4 and node 8 - recreates in both. But yes, the node does require a newer node.js version. However the error you’re hitting is in the browser and shouldn’t have anything to do with the version of node. By all means continuing speculating, but given I can recreate it, I will have a definitive answer for you shortly. @knolleary, @zenofmud I modified the code by replacing let with var and by removing the inline function declare syntax and replacing with something that is effectively similar but not as elegant. The configure pencil icon now appears in the node. Ah right - there are actually two bugs here. 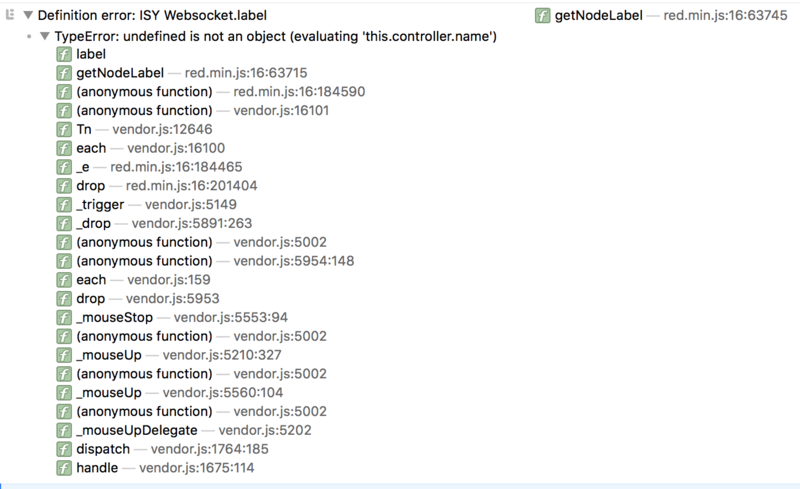 The ISY WebSocket node’s label function assumes this.controller exists, which it won’t for a newly added node. That is the cause of the stack trace you see in the browser log. But it is completely separate to the lack of the pencil icon. The ISY Controller node requires node 6 or later. If you’re running on an earlier version then that node won’t get loaded. That means when you edit the websocket node it can’t find the isy-controller type so doesn’t build the usual config node ui with the pencil button etc.